OK, Finally and I got it right, on the second go around. the domes are triple chocolate mousse with a chocolate sponge punched with rum. with an offset, but dont drag the colors too much otherwise you will get a "murky" effect. as a foot note the drippings may be reused for the small individuals, and the white glaze maybe tinted red, or any color for even more spectacular effects. I have little clue whats going on with this sorry. I think I understand everything but really dont get what is really taking place, Mike could you help me out? Thank-you Michael. I've added this Demo thread to our list posted at the top of this Forum. I absolutely love the effect that you have achieved here, but I am not clear from looking at the demo how you did it. Could you post a couple more pictures to help me understand? Thanks for posting this..... your results are awesome! But I, too, need help following what you're doing. Would you mind adding a caption to each photo letting us know the steps you took? sorry folks, it's been a little hectic getting ready for Easter weekend. allow me to recap, and I am sorry the pics were taken after the fact with a digital camera phone, and due to the nature of the glaze, it has to be done quickly. first the cake has to be frozen, both of the above glazes heat very nicely in the microwave but do need to be kept refrigerated. the glazes should be warmed to about 110 F. not to hot. third dab the thinned out (I used water) food paste or gel the food color seperates and some how reacts with the Titanium dioxide - it literally steaks it self - very way cool! fourth - and I am talking quickly, with an off set swirl the patterns around do not drag to much otherwise you mar the impression and it will be murky, you want clean delianations between white, blue, dark and a blending of white and dark to cream milk chocolate 'blended streaks". i hope this helps, play with it, it's a blast the counter teen at our sister store this morning kept repeating the word WOW at ten second intervals, when she saw the cakes, so I guess I accomplished my mission statement. In Darth Vader voice: "Impressive. MOST Impressive." Those look really cool! I was wondering, with the cake with the dark choc glaze and macaroons with poppy seeds on the side, is that bubbly effect in the glaze done the same way? yes it is, but it is an inverse, you are coating the cake first with Dark, striping it with white, thin applying droplets of liguid food color, they will react with the white and create that "globular" effect. also thank you John, I have seen your work, and the Force runs deeps with you also my young Jedi, I had a Chocolate company back in the 90's in Timonium called "Pirouette", very big hit, Americans balk at high end Chocolate sold at over $35.00/pound with with the right marketing and a brick and mortar local to back it up, you can make it work. that looks way wicked!!!! thanks so much for the demo!! Please tell me what "Pate' a glace' (compound coating) is??? Can it be substituted with anything more common? These are the sorts of things that make me truly admire pastry chefs. WOW. Can I quote your counter teen and say it again? WOW. Those are some mighty impressive cakes. 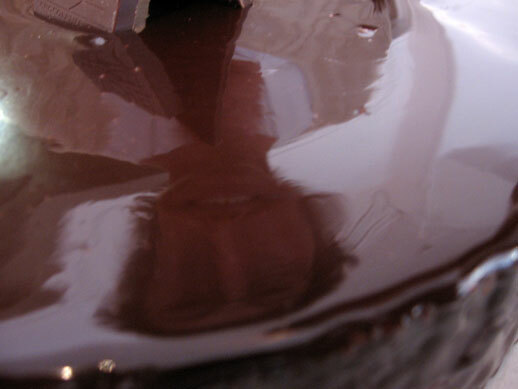 Glazing chocolate (Pate a Glace): Chocolate that will be used for glazing must be thinned so it will have a more fluid consistency when melted and will spread easily, yet set quickly. This could be done by adding cocoa butter or using couverture chocolate, but the high cocoa-butter content would make a brittle coating that would shatter easily when cut. The chocolate glaze that is sold for professional use in France contains vegetable oil, so it doesn’t shatter so easily and stores well. However, for home use we recommend thinning the chocolate with dairy butter, which gives a superior flavor and texture. It can also be purchased from many online retailers that sell chocolate in bulk. I look it at this way, it's Art, and a beut of a craft, if done smartly, it has taken a quarter of a lifetime to reach that skill level, albeit a long and winding yellow brick road, all things considered, the industry has been good to me. Probably a dumb question (I'm still a real rookie when it comes to pastry work), but what's the reason for using both corn syrup and glucose? I know there are chemical differences, but thought one could generally be substituted for the other. Do they behave in a significantly different way? 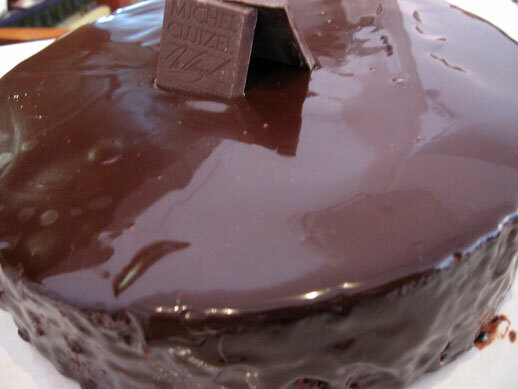 Just as a footnote, I have made this with 100% corn syrup, It's just that the glucose/syrup offers a ultra high sheen, plasticity, and fluidic quality, similar to Valrhona's Mirror brillant glaze, I handed this one to you guys, my stuff really does work. I have never purchased Pate Glacier. Can you dumb it down my brother, or is it just coating chocolate, the no temper sh.......t if so then great I can get that. Very cool look, Jaquey Pfeiffer taught me something that gave almost the same effect. It was with chocolate and whipping air into it, gave that space age look. I was about to ask the same , about the pate glacier ( SP) I am not really sure I know what it is . hey everyone, please check out this thread to get basic information on glazes and pate a glacer...there is some confusion in terminology so it really depends on the brand of product you're buying. if you're making it yourself, then it is just a glaze. Thank you , I have should read around , I always have some trouble to understand the stuff some of you mention here just because most of the pastry chefs here use terms and are based on french pastry schools, I am from Italy and I always worked with italian terms and formulas . My first try at mirror glaze. I didn't prime the cake with a buttercream so its glaze on cake. Still, I'm pretty happy. My question is though that I had what looked like an oil slick in one section. All I can guess is that when I strained my glaze into a cup to pour onto the cake, either the strainer or the new cup had something in it that led to the slick. No one noticed but me. Any ideas? This was a gelatin glaze. Look! You can see the birthday girl's face! Looks good Rob. Nice and shiny. I've been wanting to try this since I first read this demo quite a while back but I've had no luck at all finding pate a glace here in Canada or through an online vendor. I made my own and it was very fast, very easy and super tasty. My cocoa was Valrhona, and my gelatin was silver sheets. I was going to make my own following the recipes above but the pate a glace white and pate a glace brune called for in the two recipes are what I'm having trouble finding. Everything in the recipes is stuff I always have around except for those two items. Did you use the recipe in this demo or do you have one of your own?